It’s no secret that Canada’s landscape is graced with pristine natural treasures. Millions of outdoor explorers frequent national and provincial parks year round to appreciate dense forests, sprawling shorelines and unique species. But what makes these park visitors happy — and what are the benefits of immersing oneself in such environments? Laurier graduate student Catherine Reining has been spending her summer days in Pinery Provincial Park, on the shores of Lake Huron, working to identify just that: the perceived health and well-being benefits associated with park visitor experiences. As part of her master’s research in environmental studies, she has identified 15 different ecosystems housed within the Pinery, where she’ll ask visitors to complete a five-minute, tablet-based survey about how their experience affects their health and well-being. 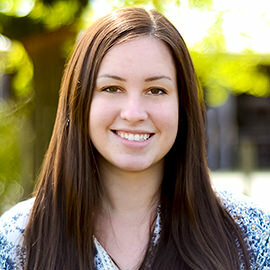 “When the opportunity came up to work on this project, it was the perfect combination of being able to relate human experiences in different natural environments to park planning and management,” says Reining, who holds a bachelor’s degree in Geography and Environmental Studies from Laurier and a Bachelor of Education from Brock University. She’s currently in her first year of her Laurier’s master’s program in Environmental Studies. With an interest in natural resource planning, management and education, particularly in parks and protected areas, Reining is motivated to strengthen peoples’ relationships with the natural environment. Her research builds on findings by her master’s co-supervisor, Christopher Lemieux, assistant professor in the Department of Geography and Environmental Studies. Lemieux found that perceived health and well-being benefits from visiting parks and other forms of protected areas are substantial and a highly positive life experience. His work in Ontario and Alberta explores this work in detail. “The greatest health and well-being benefits received from visits include psychological and emotional wellness, from stress relief, relaxation and rejuvenation; social wellness, from spending time with family and friends; and physical wellness, from participating in physical activities, such as hiking, canoeing and swimming,” says Lemieux. Echoing Lemieux, Reining says her findings will benefit Ontario Parks, park visitors and the broader conservation community by better understanding the intangible benefits of parks, such as their role in reducing stress and providing spaces for relaxation, rejuvenation and social bonding. Reining has trips planned to Pinery Provincial Park in three-day segments throughout most weeks this summer on a mix of weekends and weekdays. Anyone interested in getting involved with the study, which has received in-kind support from Ontario Parks, should follow Reining on Twitter for updates on when and where she’ll be at the park.